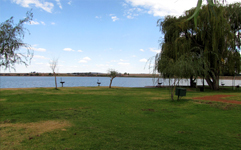 The town was established on the farm Roodepoort 22, property of Mr JH Venter. It is believed that Venter allocated stands as early as 1860.With the development of a farming community in the area, more and more people bought property from Venter.The first NG Church parish was established in 1866, and the first church was built in 1889. This building was later used as the church hall, with the completion of a larger red brick church in 1912, which still stands sentinel over the town. More people settled in the town after the discovery of diamonds in the area. Gold was also discovered but turned out not to be worth mining. During the South African Anglo Boer War, most of the men folk joined the Boer commandos. When the British introduced their scorched earth policy, an Irish soldier, G. Shaw, considered the tactic immoral and defected. 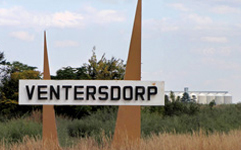 He stayed with the Engelbrecht family at Ventersdorp. When food ran out he went to a local shop for rations. British soldiers recognised him. After his capture he was tried and executed. He was buried in a far corner of the cemetery, away from both British and Boer soldiers. The site is known as The Grave With Eternal Flowers. The grave is under a tree which stays in bloom for months. In the 1960’s and 1970’s, hundreds of blacks in the town and surrounding areas were forcefully removed under apartheid laws. 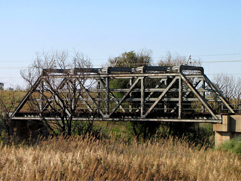 They were relocated to newly declared townships such as Makgokgwane in the former Bophuthatswana.